You might not have believed that the winter of 2014 would ever end - but it did and the trout streams found a few short hours away in Wisconsin are fishing great!!! 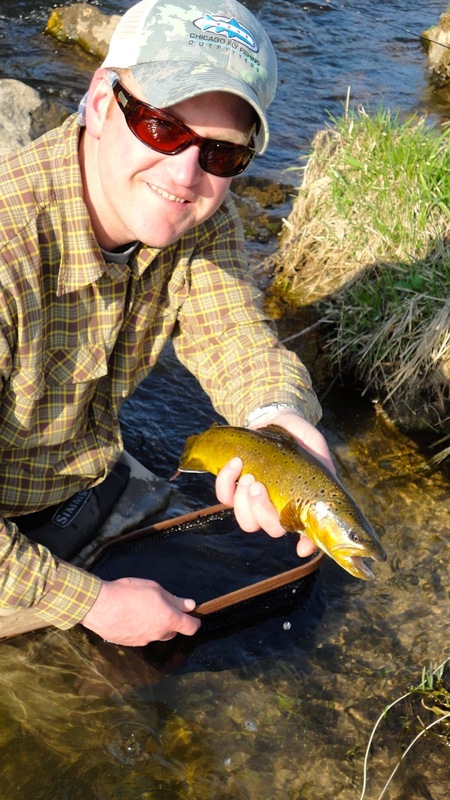 The snow is gone, the water is in superb shape, the green grass is showing up in droves, and the "good bugs" that fish eat (not the ones that will be biting you by June) are bringing the trout out of their long, dark, sleep. This is one of the best times of year to experience what all the fuss is about on the hundreds of miles of trout streams found in Wisconsin. 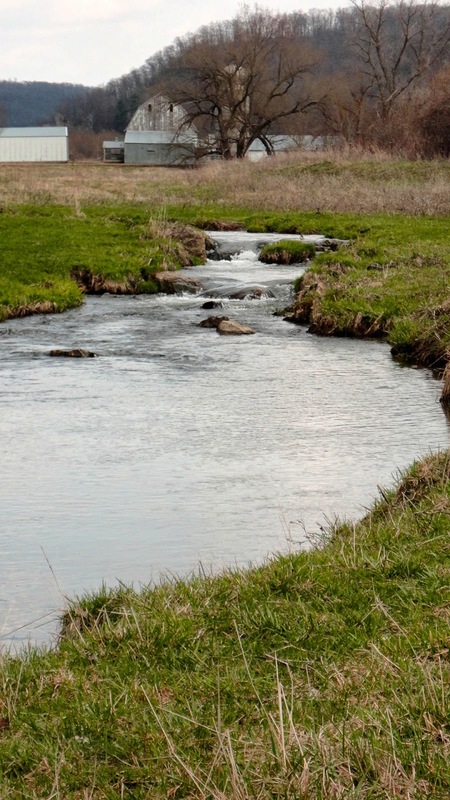 Though the majority of the state has some trout holding water, I am referring to the area known as the "driftless" found in the South West corner of the state. As the weather warms up, and the days get longer, these streams really come to life. Now is a great time to fish there, as the grasses surrounding the creeks are not too tall, and the biting varieties of insects have not yet shown up, and the temps are PERFECT for people and fish. The bugs that make up the trout's food chain, are starting to hatch which makes for sporadic dry fly fishing. First we'll see midges, small black caddis and BWO's. The tan and larger caddis are soon to come followed by a few larger mayflies such as sulphers, March Browns, and hendricksons. "I just returned from a few days in the Driftless region of SW Wisconsin. The weather was typical for April where we experienced bright sun, windy and overcast, and periods of light rain. When the conditions were right there were trout eagerly rising to Black Caddis, BWO’s, and Midges. One of my favorite dry flies this time of year is Mercer’s Missing Link Caddis as it is a nice crossover between a crippled BWO and an emerging Caddis. Most fish we caught were on nymphs such as Scuds (14 – 16), Pheasant Tails (18), and Cased Caddis (10 - 12). Water temps ranged from the high 40’s to low 50’s depending on where we fished. This was my second trip using my new Sage ESN 10’ 3wt and I am absolutely fascinated with the ability to cover water and keep my flies in the feeding zones using the tight-line Czech/Polish nymphing style of fishing. If you have not done so already try fishing flies tied on jig hooks as they don’t snag as much. If you are interested in learning more about short-line nymphing we would be happy to help demystify this technique. We have numerous books such as Dynamic Nymphing by George Daniels and DVD’s like Steve Parrot's Czech Nymphing Master Class on the subject and we can explain the leader material, sighters (indicators), and jig flies used in this effective technique. Get out soon! 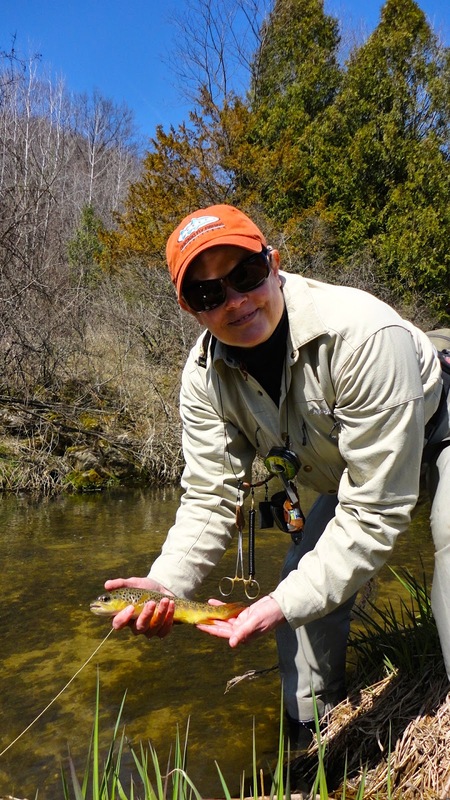 Keep in mind the that the "Early Trout Season" closes in Wisconsin for a week on April 27th - and re-opens with standard regulations May 3rd. "